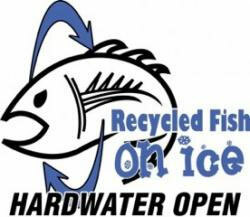 Ice Fishermen have a chance to test - and build - their skills while supporting stewardship of our waters by competing in the Recycled Fish Hardwater Open Tournaments this winter. Two tournaments held last year are back. The Okoboji Hardwater Open will be held at Okoboji Lake, January 8-9, 2011 near Milford, Iowa. The Big Creek Hardwater Open is held January 29-30, 2011 near Des Moines, Iowa. Recycled Fish also announces the addition of a new national online tournament being held in conjunction with Angling Masters International. The AMI Hardwater Open lets anglers fish when they want, where they want, for what they want - anywhere across the Ice Belt - and win prizes like a guided Canadian Ice Fishing Vacation. "The tournaments give anglers a chance to take home cash, prizes and a 'piece of ice' said Ben Leal, Tournament Director. "These events fill a niche in ice fishing, while helping us raise funds and educate anglers about being good stewards of our waters." The Okoboji and Big Creek Hardwater Open events are open tournaments; open to any angler that would like to compete, and not connected to any series or points race. They feature a free hot lunch served to contestants right on the ice during Saturday's pre-fishing time, an "Ice Bash" party and rules meeting Saturday night, and ice fishing competition on Sunday. The AMI Hardwater Open is brand new tournament concept where anglers compete throughout the Ice Belt, using an on line format hosted by Angling Masters International. This season long tournament begins January 7, 2011 and ends February 24, 2011. How about the fishing? For the Okoboji tournament it's sight fishing for the 10 largest bluegill on Little Emerson Bay. For the Big Creek tournament anglers race for a mixed bag - the best 5 crappie and 5 bluegill in what are conventional Iowa fishing conditions. In the AMI Hardwater Open, anglers fish for a wide variety of species, anywhere in the Ice Belt, whenever they want. "For our event-based Hardwater Opens, fish have to be weighed alive," says Leal, "and we'll have a release pit so that anybody who would like to return their fish to the lake can do so. However, those who want to keep their fish are welcome to do so. Panfish are a good choice for selective harvest, and these ten fish would be well within the legal limit for harvest." Last year the Okoboji Hardwater Open sold out, with a 60 angler max field. The Big Creek Hardwater Open saw 29 teams out on the ice for the inaugural event. "We're anticipating another sell-out at Okoboji and twice the number of registered anglers for this year's Big Creek event" said Leal. "These are a ton of fun, and everybody winds up learning a lot. Our T-shirt this year is really cool, too!" Registration is open now at www.RecycledFish.org, and costs just $65 plus an additional $5 "Berkley Big Fish Pot" entry. Anglers have a chance to win cash prizes with trophies for the top three places, plus both cash and product prize packages from Berkley for the biggest fish of the day. Additional door, raffle and silent auction prizes come from Scheel's, Berkley, Strikemaster, Clam, Ice Team, Kahtoola, Ventafish, Reel Weeds, Grabber and Iowa Sportsman. For more information, to register, or for a full schedule of Recycled Fish "On Ice" events, visit www.RecycledFish.org. Recycled Fish is the 501c3 non-profit organization of anglers living a lifestyle of stewardship both on and off the water, because our lifestyle runs downstream.